The Beatles Get Back / Let It Be Promo LP from 1969. This is a studio session recording with banter and a segment of the Rooftop Concert. Cover Artwork artist(s) are currently being investigated. 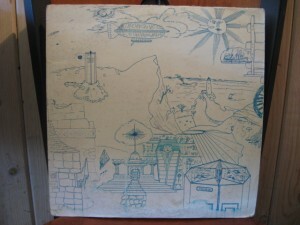 The artwork appears to be by John Lennon with Egyptian-Themed images possibly by Paul McCartney. Ringo Starr and George Harrison may have also contributed. This is a full-length, promo LP from the Beatles Get Back / Let It Be Sessions and Rooftop Concert with an interview Introduction on Side 1 by John Lennon. The original hand-drawn artwork depicts The Legend of King Lud who was the Founder of London and other London-related topics. In the Dead Wax on Side 1 is inscribed “BM-1” and in the Dead Wax on Side 2 is inscribed “BM-2”. Both sides have a trail-off groove. Both sides have a white label. On side 1 there is an inscription in the same pen as the artwork which reads 1LUD and two unidentified symbols. 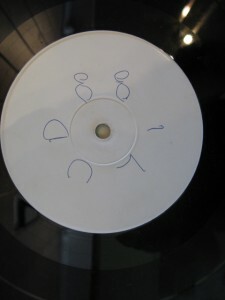 The label on side 2 is blank. The playlist is unlike anything else from the Get Back / Let It Be Sessions Nagra Tapes. It appears to be absolutely unique. There is studio banter throughout. Playlist Side 1: John Lennon “Promo” Intro, Dig It, Let It Be, Tutti Frutti, Piano, Hey Jude, Teddy Boy. Playlist Side 2: Suzy Parker, Don’t Let Me Down, Across The Universe, Shake Rattle n Roll, Kansas City, For You Blue, Get Back, The Walk, Two Of Us. If you can add any insight into this LP and it’s cover art please post your thoughts and any other comments on our blog page.